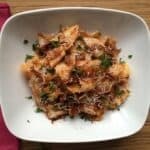 This pasta ragu sauce has plentiful, tender meat coated with a flavorful tomato sauce. It’s meaty, not saucy. The ragu goes really well with a wide flat noodle like pappardelle or tagliatelle. What a delicious Italian feast. – Browning = flavor, so brown the short ribs in a skillet first.